Breakfast or dessert? This berry oatmeal bake can go either way. Served warm it’s a guilt free breakfast treat that can’t be beat. Top it with a scoop of vanilla ice cream and it’s a friggin delight. Either way, I am always happy to have a bowl of it. If I have a batch of this made I will eat it multiple times a day. I just can’t get enough of it and will always find an excuse to get seconds. I can’t recall what was happening in my life when I stumbled across this recipe online, but I do know I immediately added the ingredients to my grocery list. This recipe was not going to be one that was printed and stored somewhere only to be forgotten about. I was making this baby tonight. Especially since the only ingredients I needed to buy was almond extract and a bag of frozen berries. So what’s in this berry delicious treat that my photo is truly not doing justice for?? Glad you asked, here are the details. For the oatmeal: Stir together the oats, sugar and 1/8 teaspoon salt in a large bowl. Whisk together the almond milk, egg, vanilla, and almond extract in a medium bowl. Pour the milk mixture into the oat mixture and stir well to combine. For the topping: Stir together the almonds, oats, sugar, butter, flour, cinnamon and 1/8 teaspoon salt in a medium bowl until evenly combined. To assemble: Pour the oatmeal into the prepared baking dish. 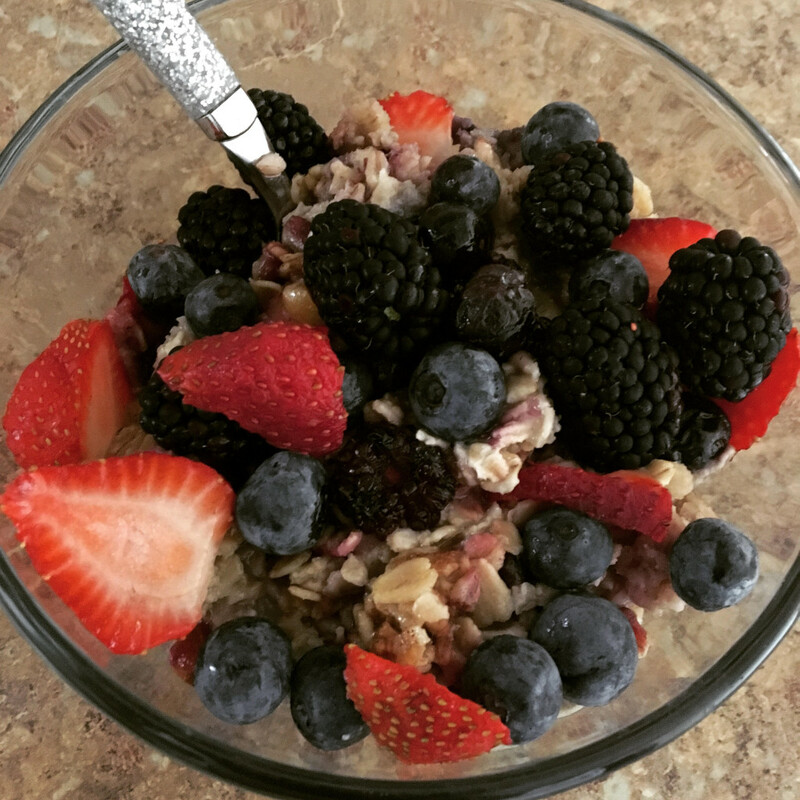 Arrange the berries (including any juices) over the oatmeal. Sprinkle with the topping. Bake until lightly browned and just set, about 50 minutes. Let cool on a rack for 10 to 15 minutes. Serve warm with a dollop of yogurt or a splash of milk if using.